Tamper proof labels that use easy tear materials coupled with strong adhesives that cause the label to disintegrate if an attempt to remove the label is made. The label is designed to leave fragments of itself behind, preventing it from being peeled from the surface to which it is attached and re-applied elsewhere. EVIDENCE OF TAMPERING with the label is obvious. Labels which incorporate security slits that become evident when the label is removed. Total absence of these slits in the label indicates that the product has been tampered with or is counterfeit. The exact location and positioning of the slits in the label is almost impossible to replicate. Tamper evident adhesives that are used to attach the label to the item needing protection leave a chequer board pattern or 'VOID' message on the surface that the label was applied to. This leaves a clear indication that a label has been removed whilst also leaving a corresponding clear window on the label so that it cannot be re-used successfully and EVIDENCE OF TAMPERING is obvious. BLUECODE Labelling Technology is particularly versatile within the tamper proof labelling market place and can produce tamper proof labels incorporating several other features including overprinting with hot foil, special holographic images, serialised barcodes along with security slits. If you have a specific security labelling requirement, please contact us to discuss your ideas in more detail and we will be pleased to offer any advice you need to provide you with the perfect labelling solution for your business. 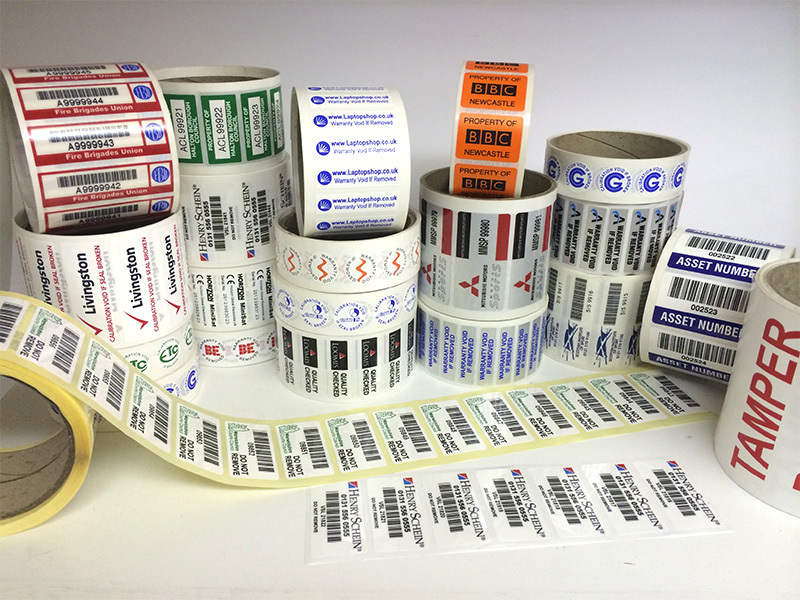 BLUECODE Labelling Technology also offer a range of Standard Security Labels and Standard Tamper Proof Labels in a range of sizes. These labels are available for immediate despatch.